Refugees, international relations, trade and democracy most nationally polled policy issues: Q1 2017 | Jenkins Research Inc. Call it the Trump Effect! Polling in Q1 of 2017 was dominated at the national level by issues that are hot-button types of issues that flow out of the politics in the U.S. Think the issues of refugees (13% of the national policy releases), international relations (13%), and trade (11%). In fact, 12% of releases were coded as being specifically about the United States. The other top area of interest was related to issues about democracy and governance. Consistent with the 2016 results, the primary category of public opinion releases is Public policy. 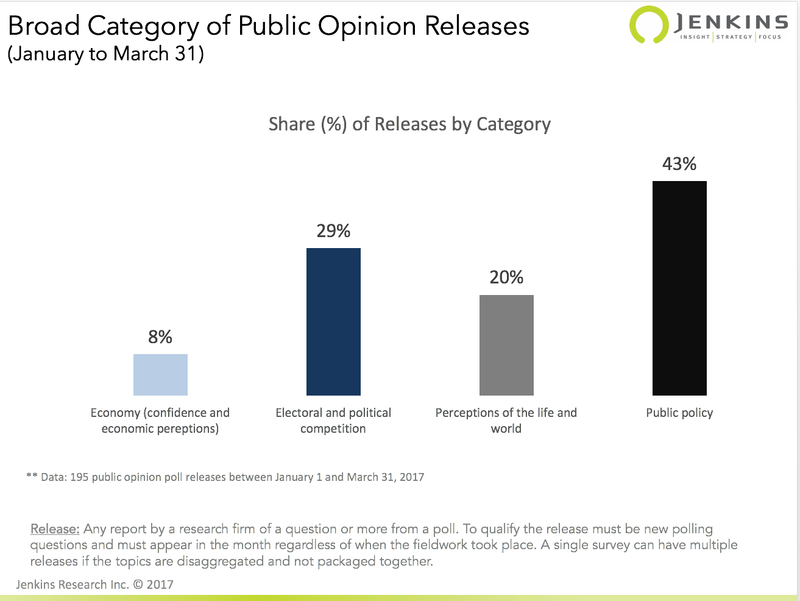 Public policy represents 43% of the releases in Q1 with electoral and political competition the next most frequent. There is naturally some overlap, but if the release was primarily about the political consequences (e.g. on ballot) of policy directions, the release was coded as being about electoral and political competition. 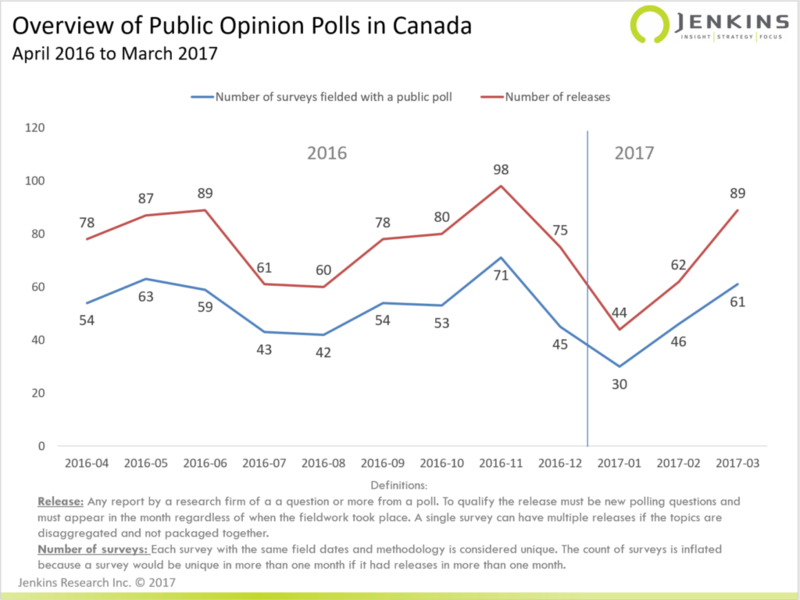 Nationally, there is less electoral and party competition releases (they represent 22%) given the polling attention being played to provincial election campaigns (e.g. B.C.) and provincial political performance. January is naturally a slow month in the polling industry. With the extended holiday period in the last half of December, there is less time to conduct the polls and Canadians are paying less attention to news so it there is less interest in sponsoring polls. January is slow then because clients return to work and start projects that they expect to release. To review the interactive, report on Q1, that shows a number of the key variables captured in the Canadian Poll Analysis click here. The Q1 report will be updated if polls are found that meet the criteria.